The individual vehicle accident occurred on Interstate 40, leaving some lanes blocked while crews participated in the chocolatey mess. No one was injured in the accident, but cleanup took about four hours. "There is a river of chocolate that blocks / flows in I-40's westbound lanes at milestone 211, east of Flagstaff," said the Arizona Department of Public Safety. "This will be a sweet cleanup!" The tanker took 40,000 pounds (12,000 gallons) of 120 degree liquid chocolate, according to the bill of lading that DPS reviewed. "A lock that connects the pram with the trailer detached, causing the tanker to roll over," said Bart Graves, Arizona DPS Media Relations Specialist, CNN via email. "The tanker was heavily damaged backwards, so we had to pump the liquid into the Median so that the tanker could be lifted on a tow truck," Graves said. 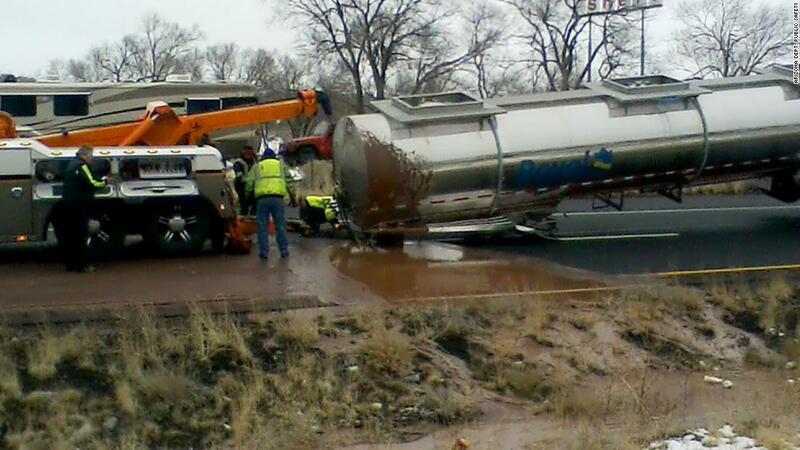 The liquid is biodegradable and the driver was not quoted for the accident, according to DPS.